I must have seen the Broadway musical revue, Ain’t Misbehavin’, about a dozen times between 1978 and 1982, including the original Broadway cast, the replacement cast, and the national touring company. I listened to the original cast recording, featuring the talents of Nell Carter, André DeShields, Armelia McQueen, Ken Page, and Charlayne Woodard hundreds of times. Only Evita rivaled Ain’t Misbehavin’ in my consciousness during those years. Its captivating tunes, and their sensational interpretations by a stellar Broadway cast, made an indelible impression. This was a perfect musical revue in an era when such shows, especially those celebrating the composers of the Harlem Renaissance—from Bubbling Brown Sugar to Eubie—were very popular. My enthusiasm for Ain’t Misbehavin’ was renewed when I saw the original Broadway cast, again, in the 10th anniversary production in 1988, and another touring production featuring the Pointer Sisters in Bob Mackie costumes in 1995. For that reason, I approach each new production of this show aware that I am filtering what I see through the memory of a show I know very well and love very much. This was on my mind when I attended the opening night of the MusicalFare production of Ain’t Misbehavin’ last week, featuring a charismatic cast of young performers, none of whom was even born when the show first became a Broadway sensation. I’d hesitate to ask if they even know who Nell Carter was. Ain’t Misbehavin’ was conceived as a celebration of the talent and legacy of Harlem jazz pianist and composer, Thomas Wright “Fats” Waller, and takes its title from one of his best known compositions. Director Richard Maltby, Jr. built this cabaret-style revue around the specific talents and physicality of its original cast, and has always acknowledged the creative contributions of this astonishing group. All the performers in the first national company duplicated the qualities of the original performers, as did every Broadway replacement, and most subsequent productions. There was always a portly baritone modeled on Ken Page, a lithe and agile tenor fashioned after André DeShields; a skinny ingénue who was a likeness of Charlayne Woodard; and two full-figured belters with larger than life personalities in the mold of Nell Carter and Armelia McQueen. (Woodard had actually taken the role over from similarly willowy singer—young Irene Cara—who originated the role in the pre-Broadway Manhattan Theater Club cabaret version). The original performers established their vivid personalities and the specific relationships that bonded the quintet together from the moment they sauntered onto the stage singing lines of the title tune. By turns, they were best friends or rivals. The deliberate imbalance of two men and three women provided for hilarious competitiveness. The presence of two buxom women and one skinny girl allowed for further playful invention. The arrogance or aloneness of each solo was countered by the exuberant joy of the ensemble numbers. And it was all set in a fantasy of mid-century America, a time of optimism, sometimes in the face of war, even as the storm clouds of the civil rights struggle loomed ahead. The MusicalFare production serves to showcase some marvelous young talent, and is sure to delight its audience. Among the women, I was most impressed with Cecilia Snow, a recent graduate of the Crane School of Music in Potsdam. Ms. Snow enjoys the advantage of having been assigned material that is appropriate for her, and she makes full use of this opportunity, landing the Nell Carter numbers with authority and all kinds of personality. From her fresh and sassy “Cash for Your Trash,” to her mournful “Mean to Me,” this performer has range and poise in abundance. Her interpretations of lyrics are clear and engaging, and she projects a likeable nonchalance as she deploys her formidable talent. Cecelia Barron and Jetaun Louie give agreeable performances challenged by a relative lack of clear distinction between their two characters in this production. Each is talented and gifted with a strong voice and pleasing presence. Barron is usually the younger more unbridled, and Louie is usually more restrained and imperious. Michael Walline’s choreography is excellent and is performed with polish. The opening of the show establishes a high standard—one that is duplicated in the second act but difficult to maintain. Precision is diminished when actors do not always articulate important words and do not offer pointed interpretations of lyrics; the romantic entanglement and rivalries implicit in the script are also blurred, but the excellence of the music keeps the forward momentum going, and keeps the audience in a state of bliss. There is not a great deal of dialogue or narration in this show. The script generally lets Fats Waller have his say through his music, and this cast capably transports us up to Harlem with songs like “The Joint is Jumpin’” into the war era with a trio of big band numbers, or into the pre-Civil Rights era with the haunting “Black and Blue.” What little narration there is has either been cut or is not included in this version. The element of resurrecting and celebrating the legacy of Fats Waller is diminished when the show neglects to tell how he would sell his songs on Tin Pan Alley for 50 bucks each, only to find them published later with other composers’ names on them. (He always insisted that he had written “I Can’t Give You Anything But Love.”) An explanation that Waller’s Harlem repertoire (songs like “Feet’s Too Big” and “Fat and Greasy”) was different from what he played downtown is also missing. Similarly, the introduction of the final sequence, elsewhere rendered as, “Recording Artist: Fats Waller,” thereby emphasizing songs he recorded but did not necessarily write, is here delivered as “Mister Fats Waller,” which is meaningless. In the main, however, audiences will be highly satisfied with a cast that is irresistibly likeable and endlessly energetic, coupled with a production that is lively, smart, and lovely to look at, with a set by Chris Schenk, costumes by Kari Drozd, and light and sound by Chris Cavanagh. While the singers are youthful, the musicians are impressively seasoned and, frankly, superb. Musical director George Caldwell—whose career has taken him from Broadway to The Tonight Show, with tours for the Count Basie Orchestra and the Duke Ellington Orchestra in between—provides a highlight of the evening in the show’s famous first moments, when a recording of Fats Waller himself playing “Ain’t Misbehavin’” segues into Caldwell picking up the familiar tune on the piano himself. Dave Siegfried on bass and Rodney Alan Harper on drums join Caldwell, and the audience gives this trio well-deserved praise in the form of sustained and enthusiastic applause. 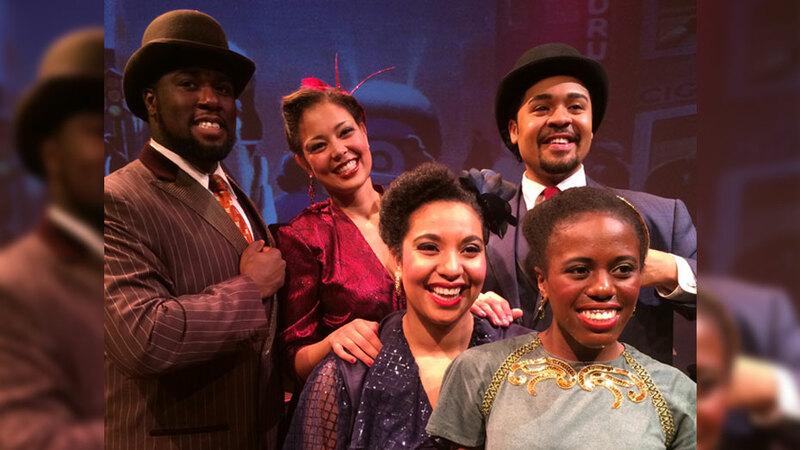 Ain’t Misbehavin’ continues through December 7. For more information see www.musicalfare.com .